The second, and final, season of Ryan Murphy's POPULAR isn't quite as much fun as it's first season. Dealing with heavier subject matters like cancer, and domestic abuse...but it still retains the quirky, snarky, over-the-top tone that carried over to his future series: GLEE. Highly recommended, it will leave you wanting more. This is a GREAT TV show! it makes you think! Also very cool, funny & strange!!! It also has funny commentary by some of the main cast stars. I love everything about the movie. :) I decided to buy it because I loved it when I was just a teenager, and now I still love it. 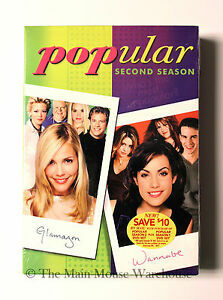 great show, i bought it because it was one of my favorite shows when I was younger and i wanted to watch it again..